Around 2009 I have heard the first time of a group of Trainers from the Dominican Republic, their „Maestro“ Juan Carlos Simo and their enthusiasm, passion and hunger for good training. Juan Carlos is known to produce big and strong girls and guys. Girls that can do 18 chinups. Guys that can Incline Benchpress 220kg for 6 reps. While building his Personaltraining gym to 250 sessions a week with 15 Trainers. Juan Carlos is the driving force behind these trainers, the results and the gym as well as half a dozen other successful PT gyms in Santo Domingo, the capital of a third world country, so definitely not the classic fertile soil for a flourishing personal training business. He is basically the godfather of caribbean personaltraining. It wasn’t until 2012 that I met Juan Carlos in person when we were both attending an Invitation-Only Seminar in Toronto. Sharing the same obsession, passion and hunger for more knowledge and applying that knowledge to get results we have been in contact since and became good friends. I visited him multiple times in the Dominican and taught the first YPSI Seminar there in winter of 2016. I am at the Las Americas Airport in Santo Domingo right now waiting for the flight back to Stuttgart after a full week in the Dominican teaching a Training Camp at the Human Performance Center together with Juan Carlos. On the first day of this trip we trained shoulders and back together with two of his junior coaches. The first exercise of the workout was a mid pulley seated fly for the rear delts. Basically a bent over lateral raise with cables. And JC gave is trainers a great cue: „Push out, not back“. Why? The most common compensation pattern in standing and bent over lateral raises is the engagement of the scapula. In the standing lateral raise it is elevating the scapula to fire the upper traps. In bent over lateral raises its the retraction of the scapula to let the mid trap take over. Both of these compensation patterns are based on the intent of moving the dumbbells upwards to the ceiling. Initiating the movement with the intent of moving the dumbbells outwards instead of upwards, basically in a backhand b*tch slap pattern, eliminates this compensation pattern and increases the recruitment of the delt. A great cue and one of many that JC uses to ensure optimal recruitment of the target muscle from a biomechanics standpoint. Using a Carloading approach like the Peri-Workout Carloading Protocol is a key element of fast hypertrophy gains. A high carb intake brings some negative side effects, potentially even in the carb-tolerant people that metabolize carbohydrates in general very well. One of these side effects is glycation. Glycation, sometimes also called glycosylation, is the result of the bonding of a sugar molecule to a protein. Endogenous glycations occurs mainly in the bloodstream to a small proportion of the absorbed simple sugars: glucose, fructose, and galactose. It appears that fructose has approximately ten times the glycation activity of glucose, the primary body fuel. [ Glycation creates advanced glycation endproducts (AGEs), with some of more reactive than the sugars they are derived from, and are implicated in many age-related chronic diseases such as cardiovascular diseases (the endothelium, fibrinogen, and collagen are damaged), Alzheimer’s disease (amyloid proteins are side-products of the reactions progressing to AGEs),[ peripheral neuropathy (the myelin is attacked), and other sensory losses such as deafness (due to demyelination). Red blood cells have a consistent lifespan of 120 days and are easily accessible for measurement of glycated hemoglobin. Measurement of HbA1c—the predominant form of glycated hemoglobin—enables medium-term blood sugar control to be monitored and is therefore an excellent indicator of midterm blood sugar management. Medical doctors often use this marker as an indicator for diabetes as it represents an average blood sugar form the last three months. Many functional medicine doctors consider a level of 4.8 or below as ideal. Back to the practical aspects of this. Based on the above facts, a consistently elevated blood sugar leads to the formation of AGEs which can be measured through HbA1c. Carnosine is a di-peptide that is naturally occurs in many tissues of the body including muscle tisse. The Supplementation of Carnosine has been shown to decrease AGEs specifically HbA1c (1,2,3,4,5). Therefore Juan Carlos likes to Carnosine specifically to a Peri-Workout Carb Loading Protocol to negate the potential side effects of high-carb intake. I have touched on the concepts of Challenge Sets in a chapter in my Improve your Arms Ebook and went into different approaches. One of the approaches is a volume oriented one that I have learned from JC when I visited the Dominican Republic for the first time. In short what he likes to do is pick a lift like Chinups/Pullups, Dips, 65° DB Incline Press and Squats at the end of a workout, choose a load one can do about 15 reps or get max. reps with bodyweight in the case of dips and chinups/pullups. One set is done. This set is repeated after every workout and sometimes he throws in one of these challenge sets during a regular work day at his gym and all trainers have to get in and do one. The load always stays the same. The goal is to get at least one more rep each time its done. The effect: His clients and trainers can do a lot of reps in chins, dips, squats, etc. This approach builds work capacity without taxing the system with too much overall volume. Its great to boost muscular metabolism and to stimulate hypertrophy. Thats one major reason why there are many pairs of strong legs and plenty of well developed backs, pecs, shoulders and arms at his gym. And the all-time Challenge Set Record is still held by himself with 32 close, neutral pullups at the end of a full hour of upper body training. Juan Carlos will turn 50 this year. In over 30 years of training, training clients and traveling the world to learn he has gained a wealth of knowledge and experience. 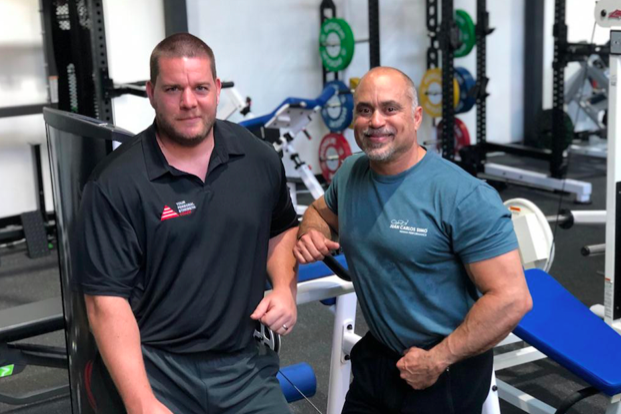 Juan Carlos just opened his 5th gym one month ago – the „Human Performance Center“ – and it is packed with clients, from Gen Pop that have been with him for 19 years to Baseball Superstars like Jean Segura and Robinson Cano which make 14 and 24 million USD a year in the Major League. And he is still at his gym 6 days per week doing personal training sessions and consults with his clients. Picture: Juan Carlos with Wolfgang during the JC Simo & YPSI Training Camp in February 2019.